When Steve took this photo, he noted (with a hint of glee?) 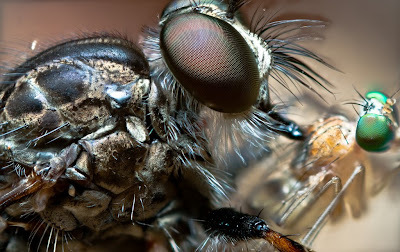 that the head of the green-eyed prey of the much larger robber fly kept moving around the whole time it was being eaten. I know we make jokes about rare steak still mooing and all that, but really, that's taking it too far. I don't know which is worse: simply gobbling up your prey, or jamming your tongue into it and siphoning off its innards. I think I'd prefer to be eaten outright. I don't know why I'm even considering either scenario, since most human robbers simply want my stuff, and they rarely intend to eat or imbibe me. Very spiffy picture. I'd like to know what lens he used. If you click the photo link, Steve gives some details of how he took the photo. If you contact him through Flickr, I'm sure he'd be happy to give you more. You might be interested in a similarly-themed photo that I posted last week: Prey bee mine. now they're saying it's a sloth that has no hair for some reason. And that the closeups don't show the claws that make it clear what it is. tetrapod zoologist: "As was the case with the Montauk Monster, the animal's real identity is bloody obvious and this is no mystery." "The animal's short face, peculiar body shape (wide belly but very narrow, tapering chest) and very long, slender arms - all very obvious in the photos shown here - immediately show that it's a sloth (albeit a hairless one: read on)." "So, sorry, no monster, no alien, no deformity, no 'genetic mutant': just another ordinary and familiar animal. Again." It's a lowly nifty fifty reversed on tubes. I have some details up if you check here.